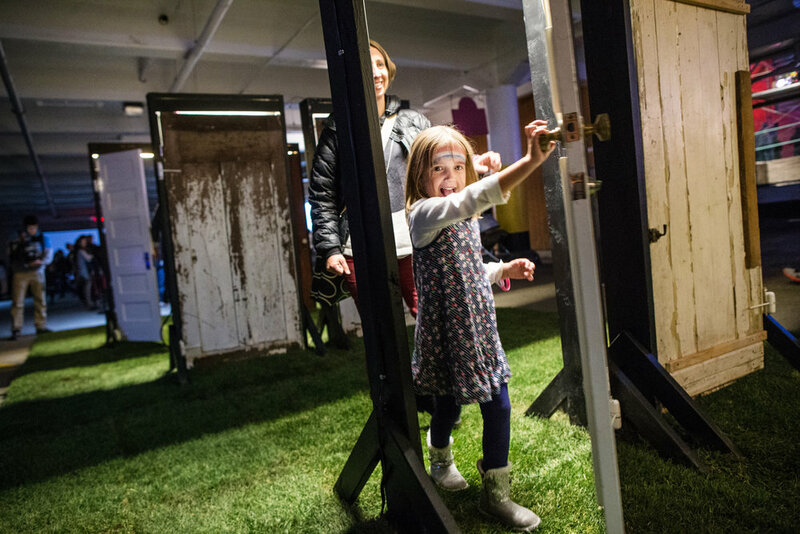 Confronted by a series of free-standing doorways, participants are asked to make a choice; for every decision there lies a doorway; through that doorway, another set of doorways; and through that doorway, another set of choices. Overhead, a large screen tracks and visualizes the data from the selections made throughout the night, revealing intricate parallels and unforeseen insights between choices and choice-makers. John Loerchner and Laura Mendes (Toronto, Canada) have been collaborating for nine years under the Labspace Studio banner. Their art projects and curatorial initiatives are often site-driven and participatory in nature, blurring the lines between art and life, incorporating elements of performance, installation, multimedia and public-generated content. Recent and upcoming projects include commissions for Maison Des Arts in Quebec, Toronto's Pam Am Games, Art Souterrain, Nuit Blanche Toronto, The Artist Project Contemporary Art Fair, Art in Transit, Harbourfront Centre, and No.9 Contemporary Art & The Environment.